The 6-10 Connector has suppressed the city’s economic and social potential for decades. It can't wait much longer. 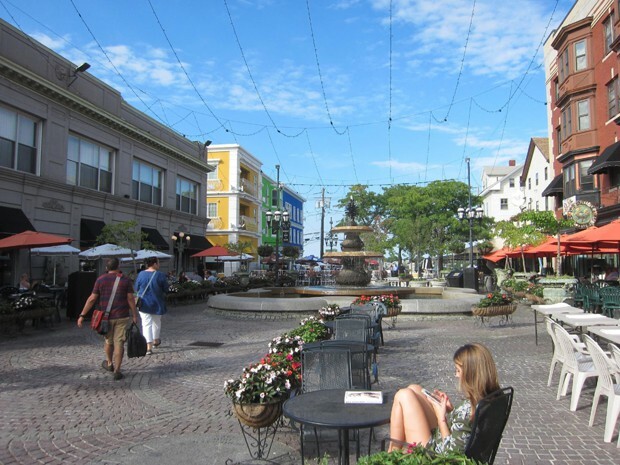 Providence’s DePasquale Square is a delightful experience in the summer. The fountain-cooled oasis is surrounded by restaurants and people, creating a scene that resembles a piazza in Italy. But walk just a few hundred feet further and the square runs into a chain link fence separating pedestrians from ramps that feed into what’s known as the 6-10 Connector. This scene of Urban Nirvana-Meets-Freeway Dystopia is not unusual in Providence. During the 1950s and ‘60s, the city was carved up by a series of freeways that left islands of urbanity disconnected from each other. But in some ways Providence has been fortunate: the freeways did separate neighborhoods, but the fabric of the neighborhoods themselves was left largely intact. This is unlike other nearby cities such as Springfield, Hartford, and Bridgeport, where urban renewal devastated the traditional New England town layouts, especially in their downtowns. Providence still largely retains its turn-of-the-century city center, along with neighborhoods of brick townhouses and Victorian homes. Providence has also been more active than most American cities in tackling some of the worst excesses of mid-century planning. In the 1990s, it uncovered a major downtown river which is now the scene of the art piece and major tourist attraction, WaterFire. More recently, the city and state moved a freeway one half-mile down the road in order to free up land contiguous to downtown for development. Providence’s downtown (“Downcity” as it’s known, locally) is also flourishing. This is partly the result of the aforementioned lack of urban renewal, coupled with a 1990s city master plan authored by the famed New Urbanists at Duany Plater-Zyberk. Downcity has also benefited from local developers who have renovated and revitalized the many impressive 20th century buildings that were spared from urban renewal. The 6-10 Connector transformation could be the next big initiative to strengthen Providence as a city. The freeway, like many of its contemporaries around the country, is at the end of its useful life and requires extensive and expensive reconstruction. More and more cities and states around the country see the need for urban freeway reconstruction as an opportunity to repair the fabric of the cities harmed by them. With these opportunities come two choices: remove the freeway entirely, or upgrade it in a way that mitigates their negative impact. One of the most dramatic examples of urban freeway removal is in Seoul, South Korea, where a highway that once carried over 160,000 vehicles daily was dismantled in the early 2000s. The highway was built over a river, which was uncovered with the removal of the highway and is now a beautiful park in the heart of Seoul called the Cheonggyecheon. As James Kennedy, one of the founders of Move Together Providence, points out, part of the Cheonggyecheon’s inspiration comes from Waterplace Park, the uncovered river and park in Providence. Move Together Providence developed a concept to replace the 6-10 with a surface boulevard. The main elements of their plan include: reconnecting the surface street grid, freeing up acres of land for redevelopment, prioritizing bus rapid transit as the main mode of travel along the corridor, and restoring the Olneyville commercial district (once known as the second downtown of Providence) that has been devastated by the 6-10. This vision has galvanized a lot of local support and has led the City of Providence, under the leadership of Mayor Elorza, to develop its own plans for reconfiguring the 6-10. The big difference between the two plans is that the city is proposing an urban parkway rather than a boulevard. This compromise is a response to Rhode Island’s state government, which is not yet convinced of either plan and has proposed fast-tracking a rebuilding of the Connector as is. This action from the state is seen by urbanists and highway removal advocates as simply retrogressive. New England has become a hotbed for debates about the future of urban freeways. In Hartford, there are two competing schemes addressing the divide caused by local freeways. For years, the state and the city have been studying what to do with I-84, which is partly on a viaduct dividing the downtown from the North End. This study seems to be converging on a plan to bring I-84 to grade and partly deck it over so as to bring a measure of connectivity between downtown and the North End. Recently, Connecticut congressman John Larson announced a much more radical plan to put both I-84 and I-91 in tunnels as they pass through Hartford. These plans represent a remarkable admission by elected officials of the damage freeways have to done to New England’s cities. What they’re still not ready to deal with is that freeways don’t make urban travel easier as much as they create dysfunctional travel patterns that lead to an over-reliance on freeways for simple, local trips. This is certainly the case in Providence, where the 6-10 completely disrupts the local street network. It’s quite likely that its removal would cut car traffic on any replacement facility by more that half based on previous cases where freeways have been removed and replaced with streets that are better connected to the local grid. The first challenge for Providence and its freeway removal advocates is to convince state officials that the matter is urgent. They'll also have to convince the state not to waste as much as $1 billion* on a misguided ‘all things to all people’ solution such as a tunnel project. The 6-10 Connector has suppressed Providence’s economic and social potential for decades. The city can't wait for something better much longer. Correction: A previous version of this article misstated the estimated cost of a tunnel proposal for the 6-10 Connector. Such a proposal is expected to cost $1 billion, not billions, to build.